Group menus and controls into distinct categories with this sidebar navigation system. 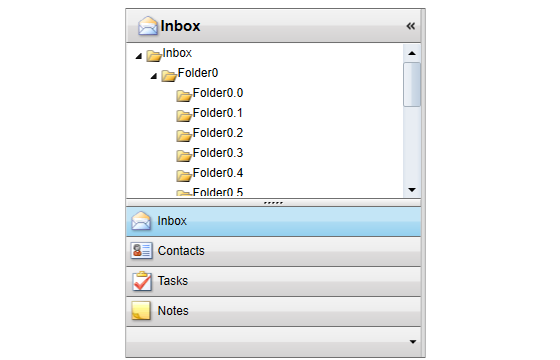 ComponentOne OutlookBar™ for WPF mimics the Microsoft Outlook navigation pane. It consists of any number of categories represented by buttons, which each have a header as well as a panel for adding additional controls. Group content and navigation menus into distinct categories, just like the navigation system used in Microsoft Outlook. This model helps you organize content and enables end users to navigate quickly. Enable the OutlookBar control to collapse to the left or right of the page. Use the splitter bar to stack buttons into the collapsed item panel located at the bottom of the control. When buttons overflow, they will appear in the drop-down menu for selection. OutlookBar is an ItemsControl that can be bound to any list of objects of any data type using DataTemplates to create a visual representation of the items. Because OutlookBar supports ComponentOne ClearStyle™ technology, you can change control brushes without having to override templates. By setting a few brush properties in Visual Studio, you can quickly style each part of the OutlookBar.